The Buildings library is a free library for modeling building energy and control systems. 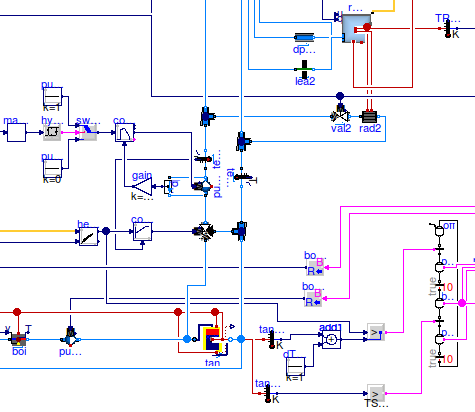 Many models are based on models from the package Modelica.Fluid and use the same ports to ensure compatibility with the Modelica Standard Library. The figure below shows a section of the schematic view of the model Buildings.Examples.HydronicHeating. In the lower part of the figure, there is a dynamic model of a boiler, a pump and a stratified energy storage tank. Based on the temperatures of the storage tank, a finite state machine switches the boiler and its pump on and off. The heat distribution is done using a hydronic heating system with a three way valve and a pump with variable revolutions. The upper right hand corner shows a room model that is connected to a radiator whose flow is controlled by a thermostatic valve. The web page for this library is http://simulationresearch.lbl.gov/modelica, and the development page is https://github.com/lbl-srg/modelica-buildings. Contributions to further advance the library are welcomed. Contributions may not only be in the form of model development, but also through model use, model testing, requirements definition or providing feedback regarding the model applicability to solve specific problems.